After the Blue Planet II effect brought plastic waste to the public’s attention in 2018, a spotlight was shone on the amount of annual household waste that is being produced every year. This encouraged many people to think more consciously about the amount of wasted food, plastic, glass, paper and cardboard and clothes that they produce each year in the UK and how they can take steps to reduce this. Read on to find out the many ways you can reduce your household waste. The UK is still on track to meet the EU target to reduce Biodegradable Municipal Waste (BMW) sent to landfill by 35 per cent of the 1995 baseline by 2020, according to Defra’s recent data. In 2016, the number of BMWs that were sent to landfill was similar to the amount recorded in 2015, equalling 7.7 million tonnes or 22 per cent of the 1995 baseline value. The baseline value is the landfill directive target set by the EU to reduce the quantity of municipal waste that is diverted to landfill which impacts on greenhouse gas emissions that is associated with waste management. However, the UK fell short when it came to recycling packaging waste in 2016 according to recent data from Defra. 71.4 per cent of packaging waste was either recycled or recovered, which is a 64.7 per cent improvement from 2015 which is exceeding the EU’s current target of 60 per cent, which is fantastic news for the UK! The recycling rate for household waste in the UK is improving according to recent data from Defra. The recycling rate for Waste from Households (WfH) increased across all UK countries from 44.6 per cent in 2015 to 45.2 per cent in 2016. This is an important figure because the EU has put a target in place for the UK to recycle a minimum of 50 per cent of household waste by 2020. When breaking Defra’s WfH recycling rate 2016 data down by country, England was the highest at 44.9 per cent, followed by Northern Ireland at 43.0 per cent. Meanwhile, Scotland recorded 42.8 per cent and Wales had a whopping 57.3 per cent recycling rate. Let’s remember that this is the UK’s recycling rate before the Blue Planet II effect took hold, so we are hoping that Defra’s next set of data for 2017 to 2018 will be even better; especially when you start implementing some of the following methods to help reduce your household waste. At Skip It, we understand that many people in the UK who are living with various disabilities do need to use plastic straws either on a daily basis or from time to time. However, if you are able to, you can decline a plastic straw the next time you attend a party or when you’re out and about and if you’re hosting your own bash then you can opt for paper straws instead. It can sometimes be a little difficult to remember to say “no” when you’re at a friend’s house, the pub, a bar or at a restaurant, but it can really help the environment when you refuse a single-use plastic straw. You’ve probably already heard about the amount of plastic that’s found in takeaway coffee cups due to the coating inside the cardboard cup which makes it nearly impossible to recycle in its current form. In the UK, we are responsible for throwing away 2.5 billion coffee cups each year and less than 1 in every 400 are recycled, which means that the majority will end up in landfill or the environment. Buying your own refillable coffee cup, which are often on sale in many coffee shops, will mean that you can still enjoy your favourite hot beverage throughout the day and help reduce your household and plastic waste. Similarly, if you buy your own refillable water bottle, you can help prevent environmental pollution in the UK’s waterways, beaches and cities. We get it, these days it seems like plastic is everywhere, especially when we are at the supermarket as many fresh fruits and vegetables are often unnecessarily packaged in Styrofoam and plastic. Instead, choose the loose vegetables and lay them ‘naked’ in your trolley or basket. You can dedicate one of your reusable shopping bags to these items to protect them in transit on the way home. Of course, another way to reduce your household waste is to bring your own carrier bags. Since the plastic bag charge was introduced in 2016 across the UK, there was an 85 per cent reduction in single-use plastic bags. If you can, get your milk through an old-fashioned home milk delivery in reusable glass bottles. When you get glass bottles delivered to your front door, the milkman will collect any empty ones to re-use again. Another way to be mindful of your household waste at the shops is to try to purchase cardboard, glass and paper packaging over plastic wherever possible. Better yet, if you have a health food shop near you, see if they have refill stations where you can bring your own non-plastic containers and fill up on basics like cereals and rice. This way, you will only buy the amount you need, saving on food waste as well! You can even find refill stations in some shops for other domestic products like washing up liquid and laundry liquid. Find out more at Zerowaste. 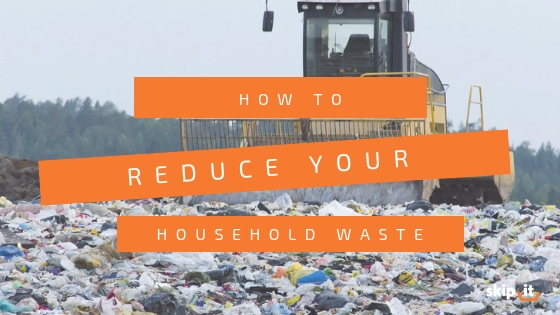 If you want to consider reducing your household waste by taking some of these steps listed above, you can really start to see a reduction in the amount of waste your household produces. At Skip It, we can help households to recycle more of their waste through a variety of household waste solutions, from Skip Hire for when you do home renovations or DIY projects to Household Clearance and Wait and Load for when you want to de-clutter your attic. We can even help you with garden waste collection too. Contact our friendly team today to find out more about our household waste services.